"The true critical thinker accepts what few people ever accept -- that one cannot routinely trust perceptions and memories." --Jim Alcock, "The Belief Engine"
Take a look at this video. 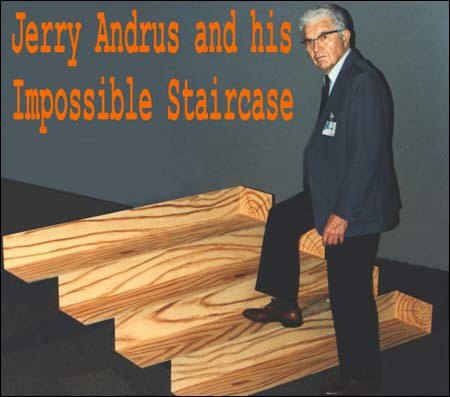 The "impossible box" was designed and constructed by Jerry Andrus (see also Sandlot Science). The brain tries to make sense out of the perceptual data it receives through the senses. First, we see Jerry inside a pen but when he walks "through the front boards" we know something tricky is going on. When we see the impossible box from another angle, we understand that our first impression was an illusion due to the angle of perspective. Many of us have not paid much attention to perspective and all our lives we've taken illusions to be the real thing. 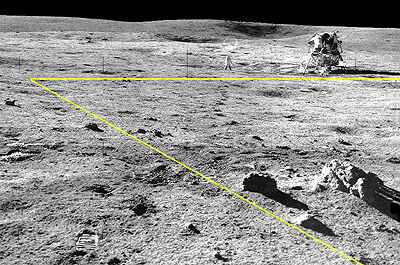 One dramatic example of this can be found in the many pages on the Internet that claim they have proof that the Apollo moon landing was a hoax. Just look at this picture! How could shadows go in different directions? Isn't this proof that the lighting is artificial and that the picture is a hoax? No, and people who say such things would know better if they had a basic understanding of perspective. Perception is a complex process by which the brain constructs visual, auditory, etc. perceptions that may or may not have anything to do with what is actually out there in the world beyond the superficies of our bodies. As psychologist Jim Alcock notes: “Our brains are also capable of generating wonderful and fantastic perceptual experiences for which we are rarely prepared. Out-of-body experiences (OBEs), hallucinations, near-death experiences (NDEs), peak experiences….” Not being prepared, we may believe that the profound effect they have on us requires some sort of extraordinary explanation involving transcendent reality. But often what we think is going on outside the body is actually going on inside the brain.